May 6 : IT's FIRST FRIDAY! 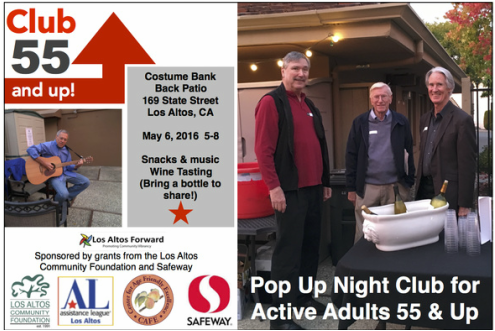 Los Altos Forward is once again sponsoring Club 55 - a Pop Up Social for Active Adults. Bring a bottle of wine to share, and bring a friend to this "grown-up" community meet and greet. Open from 5:00 - 8:00 pm. This event is to be held alongside Los Altos First Friday which will run from 6:00 - 9:00 pm and is open to all. Come, get social, and then stroll the downtown and enjoy the live music, evening shopping and fun sponsored by the downtown merchants on State Street, Main Street….1st street, 2nd street, 3rd street too. Don't shhh. Tell your friends! * First Friday activities to be held across the downtown. Come join in on the fun.